Dukes at Queens is a great base for your visit to Belfast. Whether you're travelling on business, for pleasure or leisure, we'll look after you. Dukes at Queens is one of the longest established Belfast 4 star hotels, offering stylish, spacious, modern hotel bedrooms with Villroy and Boch ensuite bathrooms. Our friendly, professional team are here 24/7 to help you enjoy the best that we and the city of Belfast has to offer. The Queens Quarter is located just south of Belfast city centre and is worth spending a day exploring, with all sights and attractions easily reached on foot. Walk along the Lagan river to the Lyric Theatre where the you can catch live plays and entertainment nightly. The Ulster Museum has extensive collections covering the natural world, human history and art (open Tuesday – Sunday; free entry). Visit Botanic Gardens with the Palm House, home to many exotic and beautiful plants and flowers. Summer in Botanic Gardens is a wonderful place to relax, enjoy the sunshine and to relax in the beautiful surroundings. Take in some of the most stunning architecture in Belfast with a wander through the grounds of Queens University designed by the famous architect John Lanyon in 1849. If you fancy going further afield you can explore the best of Belfast on foot, by bus, taxi or on one of our Belfast Bikes. The Belfast Bikes scheme offers a three day pass for just £5.00. Belfast is a small, compact city so travelling by bike is a great way to see the city. Visit the famous murals of west Belfast and stop off for a tour of the Crumlin Road Gaol, now an award winning visitor attraction. Pop back into the city and chose from a wealth of things to see and do including the Titanic Centre, SS Nomadic, the Cathedral Quarter with its many restaurants, bars and cafes, Belfast city hall and don’t forget the shopping! The Visit Belfast tourist information centre is open daily to provide you with all the information you might need to make the most of your trip. 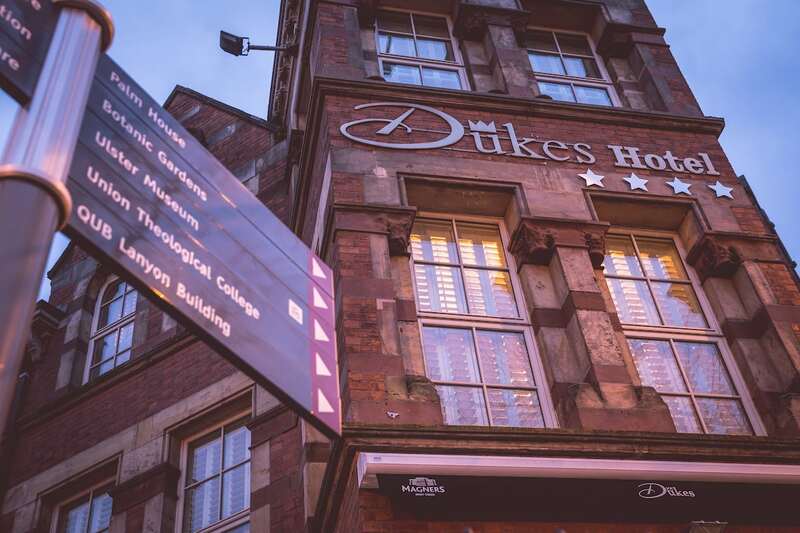 Come and experience the best of Belfast and choose to stay at Dukes at Queens. Book a fabulous bedroom at our stylish hotel from just £82.00 B&B per night. Fancy an upgrade? Treat yourself to a stay in a Luxury Room (from £102.00 B&B) or one of our Suites (from £112.00 B&B) – you’re worth it! Book direct for the best rates at our new website www.dukesatqueens.com or contact our friendly reception team on +4428 9023 6666. We’ll look after you!